Does prayer work? Does it work in your life? When is the last time you prayed for something and it actually happened? As you are thinking, let’s go even deeper. If what you prayed for actually happened, how do you know for sure it was your prayer that caused it to happen? Was it your prayer or someone else’s? I told you last week that “Sports Is Life.” I saw that come to fruition this weekend again! Let me go to last Saturday. I told you that from time to time I might find a few minutes to go out and shoot some hoops. I did this Saturday evening. I knew I needed to get a little exercise and get some “steps” in…so, out the door I go. My “go to” is basketball, of course. Just shoot and run from corner to corner and do the “around the world” routine. So, I started. It was cold. About 30 degrees and it was about 5 o’clock. I knew I didn’t have long. There was stuff to do for the evening. Nonetheless, I was nailing shot after shot. 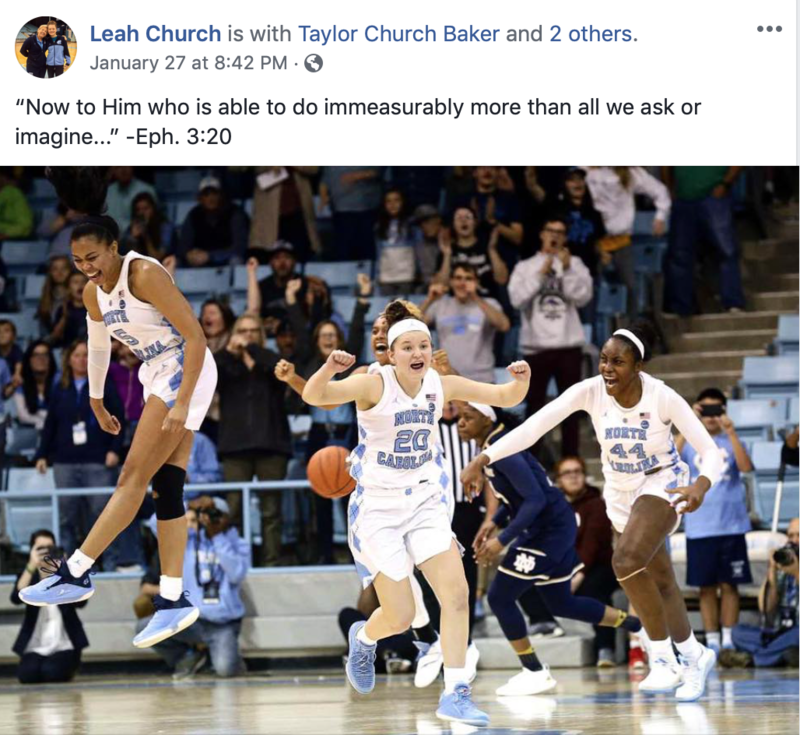 As I was shooting, I started thinking about my niece, Leah Church, who play for the Lady TarHeels. They were playing Notre Dame the next day. Notre Dame just happened to be the #1 Women’s Team in the country. They had lost just one game…to powerhouse UCONN. It was going to be a tall task. The Heels have had an up and down year… They had an 11-9 record and were 2-4 in the difficult ACC. Now let me say this…I don’t think the Lord is that interested in the outcome of ball games. I just really don’t. In the scheme of important things in life and eternity…whether it’s basketball, football, baseball…you name it… It’s just not an “eternal proposition” in most cases. Yet, I do believe He wants us to pray for our loved ones to do their best and for safety and things such as that. So, as I moved from shot to shot, I breathed a prayer for Leah and I said, “Lord, just help her and the team do their best. And Lord, give Leah 7 shots.” Why did I pray for 7 shots? That’s a big number for any player coming off the bench (which Leah usually does). But, I thought, “You have not because you ask not.” And I knew if she got up 7 shots, she’d hit 4 or 5 of them because she’s an amazing shooter! In fact, I asked several people to pray with me for 7 shots. And several said they would. The family and I loaded up and headed to Chapel Hill on Sunday. Yes, I said, “Sunday.” I’ve never done that. In 14 years of ministry, I’ve never missed a Sunday except for vacation or a mission trip. But, I believe I needed the break and family needed me to take the break and the truth is… I wanted to go! Yes, I could have sent my family without me and preached. I’ve done that before. But, the church is in excellent hands when I’m gone, so we went with total confidence and peace. Have you heard what happened? Is it even possible the Heels could beat the #1 team in the country? Well, first of all I want to tell you what happened with Leah. She didn’t get 7 shots off. She only got off two. In fact, in the first half, she to up her first shot and missed and pretty quickly was taken out for the game. 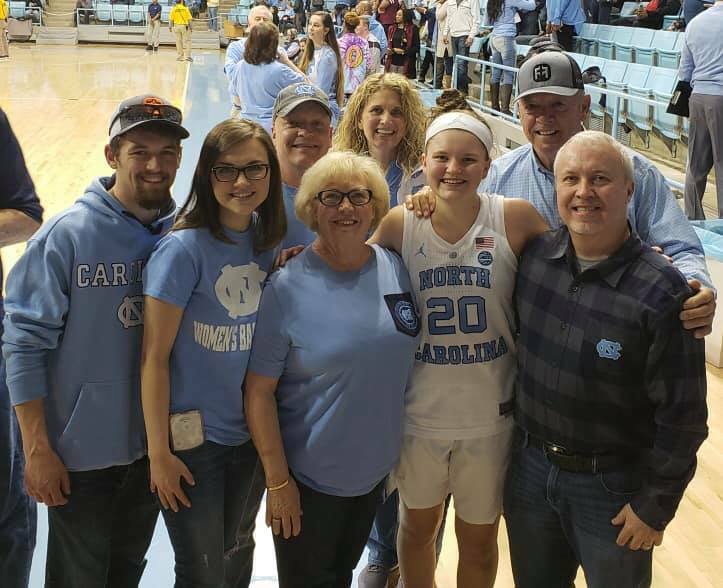 I thought, “Oh no…this is going to be tough.” But, as the game went on and the second half came…she got back in the game. The Heels were playing well. A guard for the team, Paris Kea, was on fire. She ended up with 30 points and 10 assists. Amazing! But, in order for the Heels to pull off the massive upset, something needed to happen. Did you watch the bench stand up when the ball was passed to her? They knew it was in! Paris Kea…the leading scorer in the game is the one who passed her the ball and she’s already backing up going down court the other way. She knew it was in too! Pam happened to video the shot from our seats behind the basket! Needless to say, all the family went nuts: Me, Pam, Clara, Andrew, Katy, Josh, Charlotte, Evelyn, Kandace and Clark! My mom and dad were in their seats to our right and below us. They have season tickets and of course, Kim and Craig, Taylor and Zac were in their familiar spots on the front row down below them. Not to mention that Craig’s family (dad and step-mom, step brother) was in the arena as well. 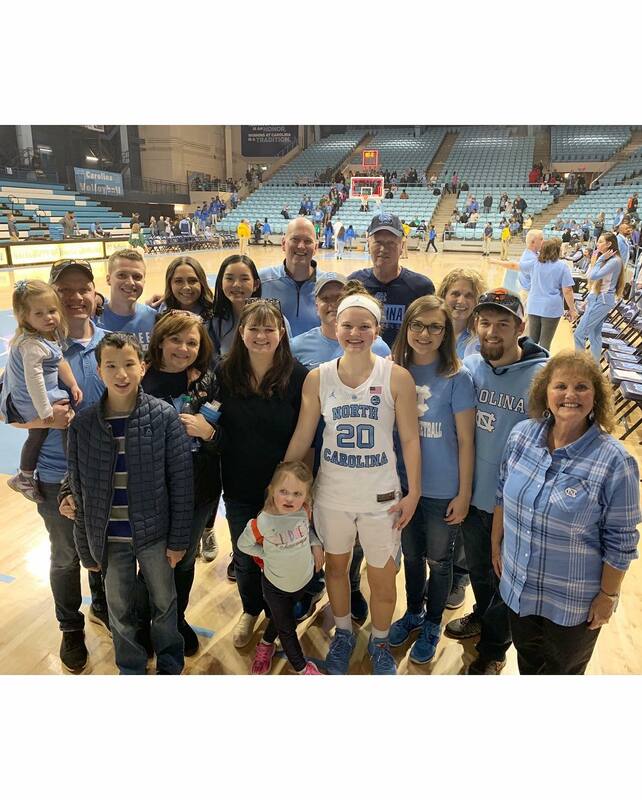 Needless to say, there were plenty of #20 Leah Church fans in Carmichael Arena! Now, why do I tell you all of this? Honestly, I really believe with all of my heart that the Lord heard the prayers of our family and those close to Leah. Did God answer my specific prayer? Obviously not! I asked for 7 shots, but she only got 2. But, it only took 1 to answer my prayer! Do you see! The Lord can answer our prayers even when it’s not exactly what we ask. He has a plan that’s so much better than ours. In fact, Leah said it best on Facebook! 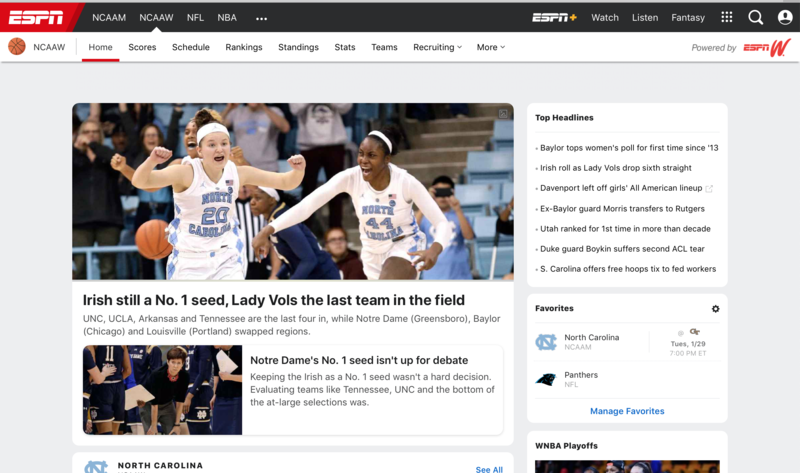 That same picture has been all over ESPN’s Women’s Basketball homepage! Does prayer work? Ask Leah Church. This is a woman who knows more about prayer and the hard work of it than anyone I know. Do you think our families were happy after the game? Let me tell you something…prayer works. James says, “The prayer of a righteous person has great power as it is working” (James 5:16). That picture above you is a prime example of that. So, pray! Pray when it seems impossible! Pray when you miss the first shot! Keep going…Keep living! Look for the next chance and keep praying! It’s worth it! Even when it’s just going 1 for 2, and you asked for 7!